ACAV’s Houston AV equipment rental is extensive and varied. Listed below are many of the most commonly requested items. To obtain a free quote, simply go to the “SHOP” tab on the menu. First, select the items you wish to rent and complete the quote form with the requested information. Provide any additional information we may need. Choose “PRINT & CALL” as your payment choice. Finally, SUBMIT. A quote will be created with taxes and all fees, additionally the system will email you a PDF copy of the quote for review. Payment confirms orders for delivery. ACAV is an Audio Visual rental company providing equipment rental and AV services. We are locally owned and operated so no shipping is required. We offer the option to self pickup & return at our warehouse for some items, we also offer delivery and setup service for an additional fee. If you have questions about your rental needs, call us at 281-550-7955. We look forward to providing you excellent service. 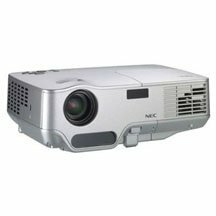 LCD Projector rentals for your meeting, event or training class in Houston Texas from ACAV, an AV rental equipment company. Projectors are a great way to show presentations to audiences of just about any size. Many devices connect to projectors, including laptops, tablets, DVD players, cable/satellite boxes, also some cell phones. Whether you need a basic projector or a full HD projector, we have them. 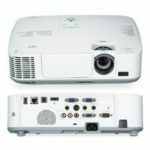 Prices are based on the type and strength of projector, as well as the rental length. We offer rentals for 24-hours, 48-hours and weekly periods. We must know what type of connection your device has, and the device you will be using. Some devices require an adapter, which we have a large selection. Adapters are offered at an additional fee which is considerably less than the purchase price. A caution regarding Mac/Apple devices – Newer Macbook Pro’s with HDMI do not work with adapters, as Mac has coded these ports to only work with full HD signals. Therefore, if you have a 2016 or newer Mac/Apple device you must use a full HD projector with built in HDMI ports. We have a full supply of projection screens in a variety of sizes. All our screens are for indoor use only. Screens are an additional cost which are separate from the rental price of projectors. Many customers ask about using USB for connection, such as a for a thumb drive. USB is not a universal connection for projectors and monitors. Projector and Monitor manufacturers may have included a USB connections on the device, but these only are programmed to accept very specific file formats which vary widely from one device to the next. None of these devices are capable of running PowerPoint from a USB device. 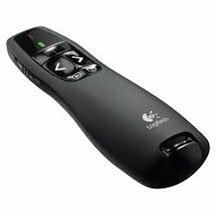 PowerPoint requires a source with a CPU to run the software which thumb drives cannot. We discourage the use of USB connection for presentations as we cannot guarantee functionality. 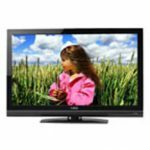 ACAV, an AV rental equipment company, has a variety of monitors and HDTV’s for meetings, events and tradeshow booths. Our selection of sizes range from 23″ to 55″. All our monitors are full HD with small sizes using DVI connections and larger sizes using HDMI. Additionally, all our flat screens have VGA connections making them highly compatible with most devices. Basic monitors and HDTV flat screens are provided with a standard table top stand. 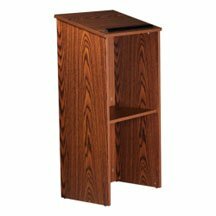 We carry Floor Stands at an additional fee for use with Flat screens 32″ and larger. Do you need a flat screen to be at eye level and self supporting? Then a Floor Stand is your answer. Floorstands are a perfect option for tradeshow booths and many events. Our floor stands include a shelf for a laptop or other source device. 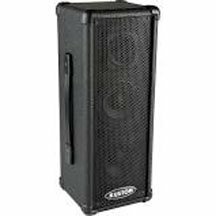 Whether you need a single small speaker for a small audience, or a large system for an audience up to 400; we have the audio equipment for your event. 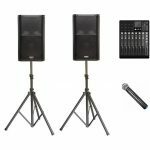 Our AV equipment rental inventory includes powered PA speakers on stands, audio mixers to connect multiple items, wireless microphones, wired hand held microphones, and cables for laptop or iPod sound. We include all necessary cables with our equipment. ACAV’s technicians will deliver, fully set up, and test equipment to assure your event has the best quality sound possible. Dinner Meetings and small training classes love our low profile, yet powerful speakers. These small and mighty speakers offer the sound quality of a large system, but take up very little space making them a great option for rooms with limited space. Unsure about exactly what you need? Call and talk to one of our highly trained professionals. We will ask for the critical information about your event, then offer recommendations based on the information. ACAV is an AV equipment rental company with integrity. 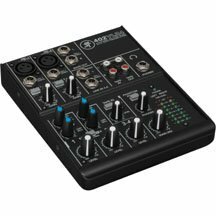 We often have customers call asking about much more equipment than is needed for an event. Don’t be a victim of other services padding their bill at your expense. Our commitment is providing the equipment you require and will not attempt to sell you on a system larger than you need.